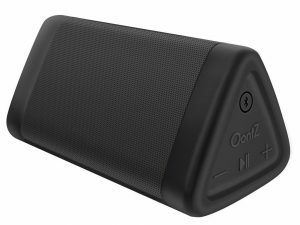 This article is created for all of you searching for the best outdoor Bluetooth speakers on the market. Whatever you need your new speaker for, this article will help you understand what are the most important things you should be paying attention to depending on the purpose, and in the end, we will give you a couple of options for every possible purpose. Hopefully, you will find this article and our list of 15 best outdoor Bluetooth speakers helpful. When and where do you want to use your outdoor Bluetooth speaker? So, the first thing we are going to talk about is the purpose. Depending on the purpose, you should be paying attention to different characteristics, although there are some features that should be taken into consideration whatever the purpose is. If you need your speaker to be louder than your phone but not too loud, and you are planning to use it during camping or when you are hiking or having a picnic with someone, then some smaller Bluetooth speaker might be the right option. You don’t want to disturb other people (or animals, if you are in the woods), but to have slightly louder and cleaner sound than the one coming from your phone’s speaker These smaller Bluetooth speakers should be just enough for this purpose, although most of them (especially the ones on our list of best outdoor speakers) can be much louder than that, and you can use them even for some smaller parties (especially if they have the option to be connected with other speakers into a system). Portability (weight and dimensions) – for this purpose you will need something you can just grab and take off, so the dimensions and weight are very important. Anything that could fit your backpack or your bag and that is not too heavy is a great option. Battery – this feature is essential for every outdoor Bluetooth speaker. You need durable battery since you want to use your speaker outdoors. If your speaker can be powered by an outside power source, that’s a plus, but the battery is still of crucial importance for every outdoor speaker. Connectivity – Quality of connection and the Bluetooth version are very important for every Bluetooth speaker. You don’t want the speaker with connection issues and you definitely don’t want to experience connection losses whenever you move your phone even when you are inside the advertised Bluetooth range. That’s why you should always try the speaker before buying it. If you don’t have the option to try it, then you should at least know that newer Bluetooth versions perform better than the older ones (in terms of connection quality, battery consumption, and maximum range), but we will elaborate later on Bluetooth versions and their characteristics. Durability – You are going to use your speaker outside, so you need it to be much more weather resistant and shockproof than indoor speakers. You should be looking for speakers with IPX rating (even IPX 1 is a plus, but if you really want a durable speaker you should be looking for IPX4 and higher, and IP67 can be considered the best since it means that certain speaker is completely waterproof and dustproof). If you want to know more about IPX ratings, there is a section in the end of this article dedicated to different IPX ratings. The other thing you should pay attention to, regarding durability, are the reinforcements and materials. Since you need your speaker to be shockproof and you don’t want your speaker to break if you accidentally drop it, you should be looking for high-quality materials (usually a combination of aluminum, sturdy industrial plastic, and rubber finish). Sound quality – the last but not least. You can’t always get great sound quality with a small Bluetooth speaker, but we managed to find some great multi-driver speakers with a great, perfectly balanced sound. If you are interested, see the list. If you want to use your Bluetooth speaker during backyard barbecue parties, or some smaller gatherings, a smaller speaker might not be loud enough, so you need something bigger and louder. We have managed to find some bigger (but still, very much portable) speakers. They are mostly boombox-shaped and produce significantly louder sound than the previously mentioned small Bluetooth speakers, and you can also find them on our list of 15 best outdoor speakers. Loudness – any speaker with maximum SPL (Sound Pressure Level) above 100dB can be considered great for this purpose. Max SPL is a bit tricky characteristic and you won’t be always able to find it in the specifications list, so you might be forced to go a little bit deeper to find this data. The terms like nominal and maximum SPL, as well as power rating, will be explained later, and we are going to dedicate one whole section to all the terms related to loudness. Portability – As we’ve already said, you can’t expect this kind of speaker to fit your backpack or a bag, but they are still portable and they don’t weigh too much, so the person of average strength should be able to carry them around. Sound quality – the sound that this type of speakers produces is usually cleaner and more balanced with stronger and more expressive bass. Battery, connectivity and durability – all the important things we’ve already said about battery, connectivity, and durability apply to this type of speakers, too. 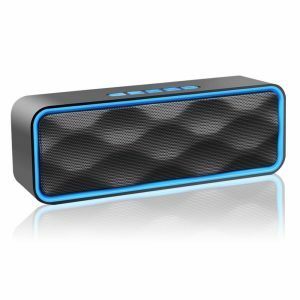 If you really want to throw an outdoor party, then you should be looking for something really large and strong, and believe it or not, there is a certain number of Bluetooth speakers that can live up to this challenge. It’s something that you probably don’t expect from an outdoor Bluetooth speaker, but these speakers will convince you that it is absolutely possible to throw an incredible party with them. Of course, there are some downsides, and the most important is related to portability. These speakers are in every way designed for outdoor use – they are battery powered, they use Bluetooth technology, they are rugged and weather resistant, but unfortunately, they are quite heavy and really big, so they are not really portable, and substantial strength is needed to move them from one place to another (you are going to need some help to carry them around). Here is our list of 15 best outdoor Bluetooth speakers in 2019. JBL is an American audio equipment manufacturer. It was founded in 1946 by James Lansing, and since the very beginning, JBL profiled itself as a company that produces mainly loudspeakers. The arrival of new technologies (like Bluetooth), brought some new players to the market, but JBL managed to find its place among the producers of portable Bluetooth speakers. JBL Flip 4 is one of the latest JBL products, and one of the best examples of JBL’s high-quality Bluetooth speakers. JBL Flip 4 comes in a nice little package, JBL really works hard on the presentation of its products. Inside the package, there are speaker, micro USB to USB cable (for charging), and quick user guide with 2-year warranty. Flip 4 is available in 7 colors and color combinations – black, white, blue, gray, red, teal, and camouflage. Speaker’s dimensions are 175mm (width), 68mm (height), 70mm (depth), and it weighs only 515g, so it’s a small speaker that you can bring with you wherever you go. It has nice rubberized enclosure, it is fully sealed, and it looks compact and rugged. At the back of the speaker, you can find four control buttons – pause/play button (which can be also used for answering/ending calls and controlling voice assistant), + and – buttons (volume controls), and Bluetooth button for pairing. Above these controls, there are two more buttons – ON/OFF button and connect plus button (for connecting 100+ Flip 4 speakers into a system). In-line with these two buttons, there is rubber flap which protects micro USB port (for battery charging) and AUX port (in case you don’t want to use Bluetooth connection, or if the Bluetooth pairing doesn’t work you can use audio cable with 3.5mm jack to connect your phone to the speaker). Inside the speaker, there are two 40mm transducers with combined output power of 16W. Flip 4 is nicely designed little speaker, it looks very simple, kind of minimalistic, it is shaped as cylinder, it’s not flashy, but it still looks appealing and kind of sporty. It’s available in 7 colors, so you will definitely find a perfect model for you. Speaker looks compact and sturdy, and there were no complaints regarding durability, so it is safe to say that this one is made to last. Some rubber-like material covers the whole speaker. Speaker looks and feels like it can survive heavy use without any problems. Flip 4 has sealed enclosure, and thanks to all the effort JBL put into designing and making, it is completely waterproof, which is the biggest improvement compared to the previous Flip 3 model (which was only splash-proof). You can take this speaker with you to the pool or to the beach, and be absolutely assured that water won’t damage it. There is, unfortunately, one negative thing that is closely related to going to the pool or to the beach, and you can read about that in ‘’Things we don’t like’’ section. Flip 4 uses Bluetooth V4.2 which works perfectly, and without any problem. Pairing is extremely simple, and the connection is stable even if your Bluetooth-enabled device is more than 33ft away from the speaker (which is advertised range). You can download this app from the app store, and use it to program the pause/play button – you can choose between two options – one is to use this button as play/pause button, and the other is to use it as button for answering/ending calls and communicating with Siri and Google Now services. The app can be used to choose between party and stereo mode in case you have two JBL Flip 4 speakers and you want to connect them. The app is very simple and very easy to use. Connect plus button is the other improvement that JBL Flip 4 brings. Flip 3 had JBL connect button which allowed you to connect your Flip 3 speaker to (only) one other JBL speaker (JBL Xtreme, JBL Charge, JBL Flip speaker). On the other hand, JBL Flip 4 is not limited to only one other speaker, but you can connect more than 100 speakers into a system (if you have that kind of money, of course). Unfortunately, there is one big downside of this feature and you can read about it in ‘’Things we don’t like’’ section. Speakerphone is nice additional feature if you like answering and ending calls with your speaker. Speakerphone works pretty well, and we haven’t noticed any problems regarding speakerphone or mic. JBL Flip 4 uses Li-ion battery with rated capacity of 3,000mAh. The battery can last for up to 12 hours if you are listening to music at moderate volume (some 60%), and up to 5 hours at max volume. It takes 3 hours for the battery to recharge. Although it’s really small, this speaker can produce very loud and very clean sound with lots of bass (thanks to two passive radiators at the top and at the bottom of the speaker). This speaker has wonderful sound for its size, lows are really strong (you can almost feel the bass), mids are articulate, and highs are clean. Having completely waterproof speaker is a nice thing, but it would be much better if it could float, but this one doesn’t float. So, if you are in a pool, be careful and don’t drop it because it will go straight to the bottom of the pool, and in that case, it can get damaged (because IPX7 rating doesn’t mean that it can survive hours in water but only submersion of up to 1m for 30 minutes). Connecting more than two speakers together to get a louder sound is really great additional feature, but as we already mentioned there is one really big letdown. The problem is that you can’t connect different speakers together (for example Flip 4 and JBL Xtreme), but only two or more JBL Flip 4 speakers (and maybe other JBL speakers produced after Flip 4, but we haven’t tried that). Doss is Chinese company established in 1999. It produced iPhone and iPad docking speakers up until 2011 when the company started producing its own Bluetooth speakers. Doss speakers have become popular very fast, especially because of their price and quality that often exceeds the expectations. Doss Touch is one of Doss’s most popular products, and it is probably the best speaker for less than $30. Doss Touch comes in a nice little packaging, it’s really more than you would expect from some cheap Chinese brand, but Doss really surprised us. Along with the speaker you will get charging cable (USB to micro USB), audio cable with straight 3.5mm jacks on both ends, carrying bag, user guide, and 1-year warranty. This is really small portable speaker – it is 6.6 inches wide, 2.7 inches deep, 2.9 inches high, and it weighs 1.1lb (560g). The front and rear panel of this small speaker are completely covered with aluminum mesh. There are Doss logos on the front panel and on the side. You can find most of the controls (which are touch sensitive, not old-fashioned) at the top – there are MODE button (for shifting between Bluetooth, AUX, and micro SD card), rewind and forward buttons (for track management), and play/pause button which can be used for answering/ending calls also. On the rear panel, you will find ON/OFF button, micro SD port (you can insert your SD card and play the music from it), AUX port, and micro USB port (for charging). Inside the speaker, there are two 1.5 inches large drivers, and one 2.6 inches large passive radiator. This little thing looks really nice, it’s boxy and small, and it is available in 4 colors – black, blue, red, and white. There are no many details, and it’s kind of minimalistic, but it is really likable. Doss Touch seem really durable and sturdy. Black aluminum mesh covers the front and rear panels, and also the left and right side of the speaker. The only sensitive part of the speaker are touch controls on the top, but we will talk about them later. This speaker uses Bluetooth V4.0, which allows connecting to any Bluetooth-enabled device in 33ft range. The pairing process is pretty simple – you should simply choose the Bluetooth mode by pressing MODE button, and then press and hold Play/Pause button until the whole LED frame at the top starts flashing (that means that pairing process has started). After that, you should just find the speaker among the available Bluetooth devices on your phone. Connection works well, but only if your phone is really close to your speaker (10-15ft). The speaker always memorizes the last device, and whenever this device is in range, they will be automatically paired. Doss Touch has 2,200mAh Lithium-ion battery, and this is pretty good battery for such a small speaker. The battery can last for up to 12 hours when the volume is at 75%, and when the volume is at 100% the battery will last 4-5 hours max. Recharge takes 3-4 hours. Built-in mic is a nice addition for those who like answering and ending calls with their speakers. Mic works well indoors, but if you want to use it outside be prepared for communication problems because mic picks up a lot of environmental sounds. Doss Touch can produce very good sound for such a small speaker and for the device in this price range (under $30), but don’t expect this speaker to fill your room with sound, especially if it is a big room – this speaker is not as loud as Flip 4 or even Anker SoundCore, but it is satisfying. If you don’t crank the volume up to the max you can get decent balance between lows, mids, and highs. When you raise the volume up to the max, there is noticeable distortion, and you can read about that in the next section. Touch controls really look nice and the whole idea of involving touch panel is very good, but we only wish these buttons not to be so sensitive. It happens sometimes, when you want to raise the volume up or down, that speaker changes track, or pauses the playback, although you didn’t want to do that. Buttons should be less sensitive, that’s for sure. Although the sound quality is satisfying, there are some issues we would like to mention. First, there is static noise when the music is not streamed. The noise is not that loud, but it is kind of annoying. Second, when you crank the volume up, this small speaker produces more bass than it can handle, and the result is noticeable distortion, so we don’t recommend listening to music at maximum volume. Although it is very portable (lightweight and small) and has battery, this speaker can be used outdoors only when the weather is nice. Doss Touch is not waterproof at all, so you should be very careful when using it, especially because the touch controls are extremely sensitive. Don’t bring it to the pool or to the beach. Anker Technology is an American-Chinese electronic equipment company. It was founded in 2011, and it became one of the most popular manufacturers of small and portable electronic devices. During 6 years of existence Anker technology evolved and started producing different types of equipment under different names, and today, there are five different brands – EUFY (lights, vacuums, EUFY Genie), ROAV (in-car equipment, mostly cameras), ZOLO (wireless headphones and smart speakers), NEBULA (portable smart projectors), ANKER (wireless charging devices). All these brands are part of Anker Technology. Anker Soundcore is one of Anker’s most popular portable speakers, and there are a lot of reasons for that. Keep reading our review if you want to find out more. Soundcore speaker comes in a simple Anker-branded box, and inside the package, you will find, besides the speaker, only one micro USB charging cable, user manual, and 18-month warranty. Anker Soundcore is really small– its dimensions are 165mm (width), 54mm (height), and 45mm (depth), and it weighs only 365g. This is one of the smallest speakers on the market. It is mostly made of thick plastic, the front panel is covered with aluminum mesh, all the controls are on the top panel, and all the input ports and mic are on the right side of the speaker. On the top panel, there are five control buttons – Power ON/OFF, Volume Down, Play/Pause button, Volume Up, and Bluetooth pairing button. On the side, you can find one LED charging indicator, AUX input, micro USB charging port and mic. Inside the speaker, there are 2 drivers (combined strength of 6W) and one passive radiator. This speaker is not flashy, but it has nice and simple boxy design, with big ANKER logo written on the aluminum grille. It is available in 3 colors – black, blue, and red. Soundcore speaker is well-made, and it looks sturdy and compact. Although it is almost completely made of plastic, it is more than capable to withstand heavy use during long periods of time. The aluminum grid gives some style, but also improves durability and protects the drivers. There is one big downside related to its outdoor use, and you can read about it in ‘’Things we don’t like section”. Since it is one of the smallest speakers on the market, you can easily bring it with you wherever you go. Its dimensions and its weight make it very good option for those searching for something portable. Anker Soundcore uses Bluetooth V4.0. 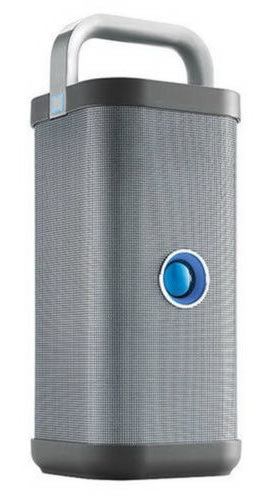 There were no compatibility issues with different Bluetooth-enabled devices, and pairing is simple – simply press the Bluetooth button to choose the right mode, blue light behind the aluminum grid will blink blue in pairing mode, and when you pair the phone and the speaker it will be solid blue. Connection works just fine when your phone is near the speaker, but there are some range issues and the connection doesn’t really work as advertised (shorter Bluetooth range). The battery is, without any doubt, the best feature of this speaker. Anker Soundcore has 4,400mAh Li-ion battery, which is pretty large battery for such a small speaker. The battery can last really long – up to 24 hours at moderate volume, which is more than you will get with any other speaker in this price range or any speaker of this size. Soundcore speaker produces decent sound for its size – it’s not the best, and there is lots of room for improvement, but you can’t expect some big sound from such a small speaker. There is some separation, but lows are a little bit muffled at high volume. Mids are articulate, while the highs lack some cleanliness. This speaker is not waterproof nor splash-proof, so you will have to be careful with it if you are going to use it outside. We advise you not to use it at the pool, or anywhere near water because it probably won’t survive more than a couple drops of water. Anker claims that the maximum range is some 66ft, but in reality, there is no way that the connection will stay stable when your phone is more than 30ft away. We advise you to leave your phone near the speaker if you don’t want to experience annoying cutting out. The mic is really nice addition if you want to make or answer/end call with your speaker, but it doesn’t really work as advertised. Some customers complained about mic being not sensitive enough, so the person you are talking to won’t hear you well. OontZ Angle 3 is made by Cambridge Soundworks, which is an American audio equipment company. Cambridge Soundworks is not a new company, it was founded in 1988, but it didn’t manage to become one of the greatest. It produces exclusively loudspeakers, and we are presenting to you their most popular product – very small, portable, and waterproof Bluetooth player OontZ Angle 3. The speaker comes in a small black and white box with OontZ logo, and inside the box, you will find (besides the speaker) charging cable (micro USB to USB), audio cable with 3.5mm jacks on both ends, and user manual. This is one more really small speaker – it is 5.25 inches wide, 2.6 inches high, and 2.8 inches deep, and it weighs only 9 ounces. On the front side, there is aluminum grille that protects the drivers, and all the controls and ports are located on the right side of the speaker. You can find there Bluetooth button at the top (with blue LED connection indicator), Volume Up and Down buttons, and play/pause button (which can be also used for answering/ending calls). Above these control buttons there is, right there on the side, small rubber cover, and under the cover, there are 2 ports – charging port and AUX-in port (in case you want to connect some non-Bluetooth device to your speaker). Inside the speaker, there are 2 neodymium drivers with combined power of 10W and at the bottom, there is passive bass radiator. OontZ Angle 3 speaker has interesting and recognizable triangular shape, which really makes it distinctive. The frame is always black, but you can choose the color of the aluminum grille. There are three colors available – black, pink, and blue. The speaker seems and feels sturdy and durable, the frame is covered with some rubber-like material, and all the ports are also protected with a rubber flap. There were no complaints in the past regarding durability. Thanks to all the rubber coverings, this speaker has IPX5 rating, which means that it is water resistant (read the explanations of different IPX ratings at the end of this article). IPX5 rating doesn’t mean that it could survive submersion, so don’t go into the pool with it. If you drop it into the water accidentally, it probably won’t survive. You can use it in the shower, or near the pool. The manufacturer didn’t provide the information on the Bluetooth version that was used, but from what we’ve experienced, pairing is easy and quick. Bluetooth connection is stable if you stay within 15ft range, anything farther than that will be problematic if there are obstacles between the speaker and your phone. The battery is pretty much average for this kind of speakers. OontZ Angle 3 uses 2,200mAh Li-ion battery which offers up to 12 hours of playtime at moderate volume (around 60%) and significantly less at max volume (4-5 hours). Recharge takes 3 hours. The mic is a nice addition if you like answering calls with your speaker. It works well, and we haven’t experienced problems during tests. This is probably one of the most important features of this speaker – it is surprisingly loud for its size, and it is much louder than similar models in the same price range, mainly because of the 10W drivers. Well, we’ve hesitated a lot before we decided to include sound quality among the things we don’t like. The sound is not completely bad, the mids are articulate, highs are pretty clean, and we already mentioned the loudness. Also, there is almost no distortion at high volume. Unfortunately, the bass is problematic – it really doesn’t sound punchy enough, and sub-bass is absolutely non-existent. That’s the biggest flaw of this speaker. To conclude, if you like strong bass coming from your speaker, this is not the best choice for you. AOMAIS is one of the youngest audio equipment companies on the market. It is only one year old. The brand became popular almost instantly, mostly because of the price-quality ratio. AOMAI produces relatively cheap products with decent functionality, and with some features that you usually expect from much more expensive speakers. AOMAIS Sport II is one of the most popular small portable Bluetooth speakers on the market, and we are presenting it to you as one of the best choices under $40. 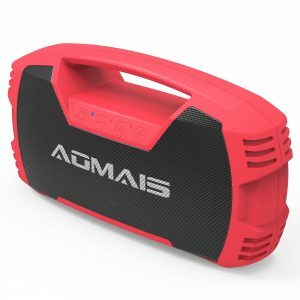 AOMAIS Sport II speaker comes in a cheap-looking cardboard box, and along with the speaker, you will get charging cable (micro USB to USB), audio cable with 3.5mm jacks on both sides, swim ring, user manual, and 1-year warranty. This is one weirdly-shaped small speaker – it is 8.2 inches wide, 3.2 inches high, and 2 inches deep, and it weighs only 22 ounces. All the controls are on the top panel, and they are, just like the speaker, weirdly-shaped. There are 4 buttons with 8 functions, and the way of pressing defines the action. The first button is Volume Down and rewind button, and if you press it shortly, the volume will go down, and if you press it and hold it, you will play the previous track. The same thing applies to Volume Up/Forward button. The third button is play/pause button which can be also used for answering and ending calls, and the fourth button is power button, and at the same time, the Bluetooth button. Under the control buttons, there are three LED lights – the green one indicates that speaker is ON, the second LED is battery indicator, and the third one is Bluetooth indicator. On the left side of the speaker, there is rubber flap which protects the AUX-in port, and micro USB charging port. Inside the speaker, there are two neodymium drivers (rated power of 20W) and at the back, there is a passive bass radiator. This speaker looks and feels really durable and rugged. One of the highly praised features of this speaker is this one. It is reinforced, there are lots of rubber parts, and the ports are also protected, so the speaker is completely sealed. There were no complaints regarding durability in the past. Thanks to all the rubber and to good construction, this speaker has IPX7 rating, which means that it is completely waterproof, and it can survive submersion of up to 1m for 30 minutes. So, if you accidentally drop it into the pool, you don’t have to worry. AOMAIS Sport II speaker uses Bluetooth V4.0 and can be paired with any Bluetooth-enabled device within 33ft range. Pairing is simple, once you master the control buttons. There were no complaints regarding connectivity or compatibility, although some users complained that the Bluetooth range shortens after time, for some reason. So, the Bluetooth range could get shorter after 6 months (or a year) of use, and you should be prepared for that. NFC is really nice additional function of this speaker, and all the Android users can benefit from it. Thanks to it, pairing takes only second or two, you just have to tap your speaker with your phone. It is possible to connect two AOMAIS Sport II speaker and get combined strength of 40W. You can use the audio cable that comes with the speaker to connect them. This is one funny-looking addition. This speaker doesn’t float, and because of that, AOMAI included swim ring in the package, so you can protect your speaker and bring it with you to the pool. If you don’t use the swim ring, and you accidentally drop the speaker into the water, it will go straight to the bottom. Built-in mic is useful additional feature if you like the idea of using your speaker for answering/ending calls. There is also some kind of passive noise canceling technology involved, so talking to someone will be easier than with some other speakers, but it won’t be absolutely perfect especially in noisy environment or during windy weather. At the bottom of the speaker there is tripod mount, so you can mount your speaker not only on bicycle but on any surface. The only problem is that you have to buy AOMAIS mount holder separately. Thanks to two 20W strong drivers, this speaker can get very loud, more than you would expect from such a small speaker. It is louder than many speakers in the same price range. This speaker has Li-ion battery with capacity of 1,800mAh. The battery allows up to 8 hours of playtime at moderate volume (50-60%), which is decent, but far from great. We would usually consider this a good thing, but many customers complained about battery. The problem is that the battery weakens a lot during time, and some customers complained that after only 6 months battery went from 8 to only 4 hours. Recharge takes some 3 hours. Although this speaker is qualified as the sports speaker and the design doesn’t really matter that much, this speaker really looks like a toy. Some small improvements would make this speaker much more attractive. If you don’t mind about the looks, or if you like it (after all, the beauty is in the eye of the beholder), then don’t pay attention to our observation. As we’ve already mentioned, the control buttons are kind of tricky and you will need some time to master the controls. However, you will still make a mistake from time to time, so it is always possible to skip the track when trying to crank the volume up. This problem could be easily solved by making 2 additional control buttons. There is no need to talk much about Bose. This is well-known American audio equipment company which produces mostly headphones and loudspeakers. Their high-end products are very popular, especially their active noise canceling headphones. Bose portable speakers are not an exception. Bose Soundlink Bluetooth speaker is one of Bose’s best and highly praised speakers. You can already find two upgraded versions of this speaker on the market (which offer better battery and some additional features), but we decided to present to you the first version which proved itself to be one of the best small portable speakers on the market. Inside nicely designed Bose box, you will find your speaker, short charging cable (micro USB to USB), power adapter, and small user manual, which you don’t really need since it is really simple to use this speaker. The speaker’s dimensions are 5.3 inches (height) x 5 inches (width) x 2.1 inches (depth), and it weighs slightly more than some other small speakers we’ve been talking about (570g). The speaker is still small enough to fit your bag or backpack. The whole front panel looks like mesh, but this is not aluminum mesh that is often used to protect the drivers. The whole speaker is compact, it is entirely made of hard industrial plastic, and the mesh on the front panel is actually made of plastic. All the controls are on the top, and you will find there 6 buttons – power button, Bluetooth button, AUX button, play/pause button, and -/+ buttons (volume controls). On the rear panel, in the bottom right corner, there are AUX input and micro USB port for charging. Bose is really secretive about the technical specs of their products, and that’s something really annoying, especially when you know that they make quality products. Unfortunately, we didn’t find the info on drivers. 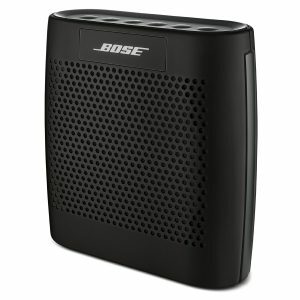 Bose always pays attention to design, and this small speaker is not an exception. Soundlink Bluetooth speaker really looks nice and stylish and could fit any surrounding easily. It is available in 5 different colors – black, white, blue, mint, and red. This is one of the good features of Bose Soundlink speaker. Although it is made entirely of plastic, it is very compact and rugged, and it looks and feels very durable. There have been no complaints regarding durability in the past, and all the previous users had only words of praise for this speaker. This speaker uses Bluetooth V4.0 which allows pairing with any Bluetooth-enabled device in 33ft range. In reality, it is slightly less than that but the connection is stable, no cutting out, and the process of pairing is very simple. Through the whole process, you will be guided by the voice prompts. If you don’t like the voice prompts, you can turn them off by pressing and holding + and – buttons at the same time. The speaker can be connected to 2 devices at the same time, and it can memorize up to 8 different devices. If you want to shift from one to another device (from your phone to your laptop, for example) you can simply press the Bluetooth button. If you want to clean the speaker’s memory, you should press and hold Bluetooth button for 10 seconds. Bose Soundlink speaker uses battery (we don’t know what’s the battery capacity) which offers up to 8 hours of playtime, and recharge takes 3 hours. If you want longer playtime and you like this speaker, you can buy one of the upgraded versions – Soundlinlk Mini II (up to 10 hours of playtime) or Soundlink III (up to 14 hours of playtime). This speaker offers pretty good, but not really loud sound. The lows are slightly muffled, mids are articulate, and highs are pretty clean. There is noticeable distortion at high volume (above 90%). Although it seems durable, this speaker doesn’t have IPX rating, so you should consider it not waterproof at all, and try to keep it away from the water. Our impression is that it could survive a couple drops, but it is probably smarter not to test it. This wouldn’t be a real flaw if there was no carrying case at all. Bose makes carrying cases for this model, but the cases are sold separately. Although it doesn’t cost that much, we still think that the case should be included in the package. This version of Soundlink Color Bluetooth speaker doesn’t have built-in mic, and you should be aware of this issue, especially if you need speakerphone. If you really like this type speaker, then you can buy one of the upgraded models which have this function. VAVA is another young audio equipment company on the market. It was established in 2015, and the speaker we are going to talk about is the first product of the VAVA company. The speaker has become very popular among customers in such a short time, and it is one of the best portable Bluetooth speakers you can buy for less than $100. This is amazing piece of audio equipment in so many aspects. Keep reading to find out more. The speaker comes in a nice stylish black box, and along with the speaker, you will get charging cable (USB to micro USB), AC power adapter, auxiliary audio cable with 3.5mm jacks on both ends, and a small user manual. The speaker is really nice looking, it is small but not as small as some previous model – it is 9.4 inches wide, 3.9 inches high, and 2.1 inches deep, and it weighs almost two pounds. So, it is heavier and bigger than previous models but it is still very much portable, you will just need a little bit more space in your bag or backpack. The whole front and rear panels are covered with aluminum grille which protects the drivers (and this little beast has five of them). All the controls are on the top. There are seven buttons on the control panel – power button (with three LED battery status indicators), Bluetooth button, hands-free button, EQ button (for shifting between 3 EQ modes – classic, party, and surround), play/pause button, and – and + buttons (volume controls). On the rear panel, there are four ports – AUX port (for connecting non-Bluetooth devices via audio cable), USB output port (for charging your phone), micro USB charging port, and AC charging port. Inside the speaker, there are 5 driver units, which is incredible for such a small device. There are two 40mm tweeters (5 Watts each), one 70mm subwoofer (10W) and two 65mm passive radiators. This is one of the most beautiful speakers on the market. It has oval shape, and it is available only in black color, and because of the shape and the color, it looks incredibly elegant. We love this speaker, and it is probably the best-looking speaker on this list. VAVA Voom 21 is very compact, very rugged, and it doesn’t look cheap. We didn’t find any flaws regarding construction quality, and customers are happy with its durability, although it isn’t really designed for all weather conditions (you can read about it in ‘’Things we don’t like’’ section). VAVA Voom 21 uses Bluetooth V4.0 with EDR protocol and it can be paired with any Bluetooth-enabled device within 33ft range. Pairing is incredibly simple, and you can even pair two devices simultaneously with the speaker. The connection is stable, and we didn’t experience any connection losses or cutting out while trying this speaker. Nice additional feature is NFC pairing. NFC logo is located between the EQ button and play/pause button. If you want even quicker pairing process, you can activate NFC function on your phone (only Android users) and tap the NFC logo on the speaker. Pairing is done in just a second or two. VAVA Voom 21 has large 6700mAh Li-Ion battery which offers up to 10 hours of listening to music at moderate volume, and the recharge takes 3 hours (with AC adapter), or 8 hours (if you use micro USB port). Depending on your mood and/or the atmosphere you can shift between three different EQ modes. EQ button doesn’t really allow you to control different frequency bands, there are only three EQ presets, but it is still nice little additional feature. 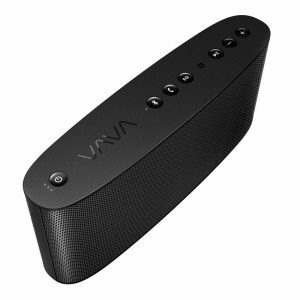 VAVA Voom 21 has built-in mic with passive noise canceling technology. VAVA also decided to separate hands-free button from play/pause button, which makes it easier to use, and we think this is really nice idea. The microphone works as advertised, we didn’t experience any difficulties while using speakerphone function. Small Bluetooth speakers usually don’t have this port, but VAVA did a great job and incorporated this additional feature. We have to give some credit to VAVA because of this small but useful feature, and this is definitely great plus for VAVA Voom 21. The sound quality is the main reason why this speaker is one of the best speakers you can buy for less than $100. It offers incredibly loud sound (for its size), and it produces strong punchy bass, full mids and super-clean highs, all thanks to its five drivers. It is also perfect for outside use thanks to drivers’ arrangement which enables 360-experience. Although it feels and looks compact and durable, this is definitely not a waterproof speaker and it doesn’t have IPX rating, so you might want to keep it away from the water. Also, don’t bring it to the pool or to the beach. UE BOOM is the first Bluetooth speaker made by Ultimate Ears company which is daughter company of Logitech. Ultimate Ears was established in 1995 in California, and it has become famous for making high-end professional earphones and Bluetooth speakers. UE Bluetooth speakers are famous for their durability and sound quality, and the first of that kind was UE BOOM, which entered the market in 2013. After the initial success, many upgrades and new versions are made (BOOM 2, BLAST, MEGABLAST, WONDERBOOM, ROLL and ROLL 2), but we have picked the first one which popularized UE brand and made it so famous. UE BOOM speaker comes in a really nice package, you can immediately see that UE cares a lot about the presentation. Inside the package, there are speaker, charging cable (USB to micro USB), AC power adapter, user manual, and 2-year warranty. This speaker reminds us of JBL Flip which we’ve already reviewed and we are going to make some comparisons of these two speakers during this review. So, the speaker is shaped like a bottle (or a cylinder) and it is covered with acoustic skin. It is 7.1 inches high, its diameter is 2.7 inches, and it weighs 1.2 pounds. The only controls on the speaker are huge + and – buttons (volume controls) and they are located on the rubber rectangle on the back side of the speaker. On the top of the speaker, there are power button and Bluetooth pairing button, while on the bottom you can find micro USB port (for charging), AUX-in port, and tripod mount which is protected with removable D-ring. AUX-in port and micro USB port are protected with rubber flap. Inside the speaker, there are one 38mm active driver and one 51mm passive radiator. We have already commented this type of design. The speaker is very likable, and it is available in many colors and color combinations – black, red/white, white, crystal edition, cyan blue, lake Moss green, orchid, pink vibe, skrillex edition, and superhero edition. Such a big number of different models is one of the reasons why this speaker is so popular (it’s not the main reason, but it is still very important and UE recognized the need for models in different colors and exploited it – good job UE). Along with the sound quality, this is one the strongest features of UE BOOM speaker. It is compact, well-built and very rugged. It gives the impression that it can survive heavy use during a long time, and many happy customers confirm this. UE did a great job and made incredibly durable speaker (probably more durable than JBL Flip 4, although it’s really hard to make this kind of estimation). You will also get 2-year warranty with this speaker. UE BOOM has IPX4 rating which means it is splash-proof (not water resistant as the manufacturer claims), so it can survive splashes of water, but not a submersion, so be careful when you are at the pool or at the beach. JBL Flip 4 has IPX7 rating and it is completely waterproof, so in terms of waterproofness, Flip4 is better than UE BOOM. UE BOOM uses Bluetooth V4.0 and it can be connected to any Bluetooth device within 50ft range. In reality, the range is slightly shorter but it is still very good. Pairing is simple and quick, and it is possible to pair two devices simultaneously with the speaker. Speaker can memorize up to 8 devices and it pairs with them whenever they are in range. This is nice additional feature, and we consider it a good thing (at least for Android users). If you want even quicker pairing, just tap the speaker with your phone, and you can immediately stream some music. Just like JBL Flip 4 has its own app, UE BOOM has one, also. You can download it from the app store, and you can do 3 things with this app – you can set the alarm (and the music will be streamed from the speaker at the time you set), you can choose one of the EQ presets (standard, bass jump, of the walls, and voices) although there is no some significant difference in sound between these presets, and there is DOUBLE UP function which will be described in the next section. So, as you know, there is this DOUBLE UP function in the UE BOOM app, which allows you to connect two UE BOOM speakers for louder sound. You can set them as stereo system (one speaker behaves as the left and the other as the right speaker), or you can stream the same source file on both speakers simultaneously. JBL Flip 4 has the same function, but with JBL Flip 4 you can connect as many speakers as you want (but they all have to be JBL Flip 4). UE BOOM has large Li-Ion battery which offers up to 15 hours of playtime. At least that’s what UE claims. In reality, you will get some 12-13 hours at 50% volume, and significantly less (4-5 hours) at maximum volume. Recharge takes 3-4 hours. UE BOOM is capable of producing great, well-balanced 360-sound. The lows are slightly muffled, but not too much, mids are articulate, and highs are clean. The sound quality is more than satisfying. The speaker is not too loud, but it is still capable of filling medium-sized room with sound. It is perfect for outdoor use thanks to 360-sound. Some people might like the controls, but we really don’t. It would be nice to have more than only two buttons (volume controls). This way, you will have to control the playback (play, pause, skip tracks) with your phone all the time. Speakerphone is always nice addition, but it doesn’t work really well. There is some cutting out even when your phone is right next to the speaker, and the voice coming from the speaker gets muffled from time to time. Well, this is the biggest deal-breaker, at least for us. This speaker is very good in many aspects, but it should really cost less in order to be competitive. 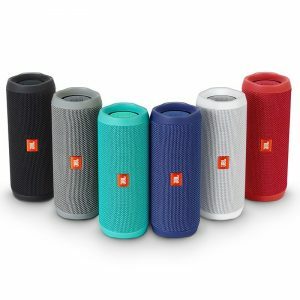 JBL Flip 4 has similar features and sound quality and costs $60 less, so we would pick JBL Flip 4 over UE BOOM every time, but if there is something you really like about UE BOOM (durability, design, sound, or anything else), then you should buy it. You won’t regret, that’s for sure. ZOEE is one of many generic brands on the market, and it is one of only a few (or maybe the only) on our list. We decided to place this product on the list because it is so budget-friendly and yet offers decent sound quality and lots of interesting features. You shouldn’t be expecting much from such a cheap product, but still, ZOEE S1 offers more than any Bluetooth speaker in this price range. ZOOE S1 comes in a small white box with, and along with the speaker, you will get charging cable (USB to micro USB), AUX audio cable with 3.5mm jacks on both ends, user manual, and 2-year warranty. The speaker is really small – its dimensions are 7.2 inches (width) x 5.1 inches (height) x 1.7 (depth) and it weighs only 12 ounces, so it is very portable. It is available in only black color with blue frame and buttons. The front panel is covered with aluminum wave-like grille. All the controls are on the top. You will find there 5 blue buttons – rewind/volume down button (if you press it once it will play the previous track, and if you press and hold, it will lower the volume), forward/volume up button, play/pause button, MODE button (for shifting between Bluetooth, AUX, micro SD card, and U-disk), and hands-free button. On the rear panel, there are U-Disk port, micro USB port (for charging), AUX-in port, ON/OFF switch, and micro SD port. Inside the speaker, there are two 40mm active drivers (combined power of 6W) and one passive bass radiator. ZOEE S1 uses Bluetooth V4.2 and can be paired with any Bluetooth device in 33ft range. The connection works just fine, there is no cutting out, the range is shorter than 33ft, but many expensive speakers have connectivity problems, so you can’t expect from this cheap device to be perfect. Pairing is very simple (everything is self-explanatory) – you just have to choose the mode and find ZOEE S1 on your phone. ZOEE S1 has Li-Ion battery with capacity of 1,800mAh which offers up to 6 hours of playtime (at 65% volume), but it is actually more like 5 hours, and it is 2-3 hours when the volume is at maximum. It’s not much, but this is a cheap device and you can’t expect more than that. Although they look like a toy, controls are very simple and easy to use. You don’t even have to read the manual. You just have to be careful, because everything seems fragile (buttons especially). This speaker is one of only a few which allows you to stream the music from U-disk or from micro SD card, which is quite unusual for such a cheap device, and we think this is something worth mentioning. There is separated hands-free button, so you don’t have to use play/pause button for answering and ending calls, which is a good thing. Speakerphone is far from perfect, there are some muffled voices from time to time, but you can still talk to someone without much disturbance. If this was some more expensive speaker, speakerphone would be thing we don’t like, but since ZOEE S1 is really cheap, we decided to praise this feature. This is nice additional feature. We don’t know will you use it, but even if you won’t, it’s good to know that you have one more option, just in case. Sound quality is not the best, but for the price, it is much more than you would expect. The sound is not perfectly balanced, the lows are slightly muffled, and mids and highs are pretty clean. There is a certain amount of distortion at high volume (above 90% or even above 85%). This speaker looks cheap (probably because IT IS cheap), it is entirely made of plastic, and it doesn’t really look durable. The buttons look really fragile, and the whole device looks like some small toy, and not some new toy, but rather something from the ‘90s. ZOEE S1 doesn’t have IPX rating and it doesn’t seem like it could survive some water, so don’t bring it with you to the pool or to the beach. Big blue party speaker is not the small speaker in any way, don’t let the picture fool, it might look like a small lantern but it is much bigger. The speaker has Brookstone label which made us think that it is probably not great (Brookstone is famous retail company, and we were skeptic about their audio equipment), but this portable speaker is definitely one of the greatest choices for any party and for any place. This amazing speaker beats any other speaker we mentioned previously in terms of sound quality and loudness, so keep reading if you want to find out more. Big blue party speaker comes in a large box. And when we say large, we mean it. We were really surprised by the size of this thing, probably because we didn’t read the dimensions, so don’t make the same mistake. The speaker is 6.3 inches wide and deep, 15.8 inches high and it weighs almost 12 pounds, so it’s not as portable as some previous speakers on the list, but it is still battery-powered, you just need to put a little bit more effort into carrying it around. Along with the speaker, you will get charging cable (USB to micro USB), AC adapter, and user manual. The speaker is completely covered with silver aluminum grille and the bottom and top sides are protected with rubber. At the top, there is metal carrying handle – you can use it for transport, it’s really strong and has a good grip. In the very middle of the speaker, there is futuristic blue button with blue LED circle around it. This is the power button which is also used for pairing (Bluetooth button). Most of the other controls are located at the top rubbery panel. You will find there three buttons – MODE button, and – and + buttons, which are used to control bass, volume, and treble. Depending on what you want to adjust you should press the MODE button until the LED below the thing you are adjusting (bass, volume, treble) becomes blue, and then use + and – to adjust it. You can see the adjustment you make thanks to LED meter, which is right above the buttons. Above the LED meter, there is small circle – this is NFC tag. At the bottom, there is also one small button with lightbulb on it, and you can use to shut down all the blue lights. We like it more with the lights, though. At the back, you will find small rubber flap, and under the flap, there are AUX-in port (up) and charging port (down), and between them, there is button which you can press if you want to know the battery status. Inside the speaker, there are four 2.5 inches mid-range speakers (with combined power of 36W), one 5.5 inches subwoofer (36W), and one passive bass radiator. The combined power of the drivers is 72W, so you can expect very loud sound. This is nice looking, well-designed, and visually appealing speaker. Only silver model is currently available, so there is no much choice, but forget about the color, there are some much more important reasons why you should buy this speaker. The speaker is well-built, there is a lot of metal, and it is rugged and compact. There were practically no complaints regarding durability in the past, so we can say with certainty that this speaker is made to last. The speaker also has IPX4 rating, which means that it is splash-proof and weather resistant. You can use it for pool parties, but you should still keep it away from the water because it is not completely waterproof. A few drops of rain or water won’t kill it, though. 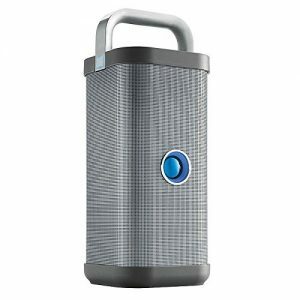 Big blue party speaker uses Bluetooth V2.1, so don’t expect great Bluetooth range, but if you (your phone) stay within some 15ft range, the connection will work fine. Pairing is simple, and it takes only a few seconds. If you want even faster pairing and if you are an Android user, you can use NFC function to pair your phone with the speaker in a second. NFC function is always nice additional feature. The speaker has large Li-Ion battery with rated capacity of 4,400mAh. The battery can last for up to 5 hours if you are listening to music at maximum volume. Recharge also takes some 4-5 hours. As we already mentioned this is really great party speaker. It can get really loud thanks to its 4 speakers and massive subwoofer. Everything you need to know about bass and treble adjustments has already been said. This is nice little detail, and it really changes the sound signature when you make the adjustments. This is, along with the loudness and durability, one of the greatest features of this speaker. The sound is well-balanced, with incredibly strong punchy bass that you can feel, full mids, and super-clean highs. Even at maximum volume, the sound remains clean and there is almost no distortion. The drivers are arranged in a way that enables 360-sound, so wherever you are, you will hear the same, loud and perfectly clean sound. We really didn’t manage to find something really bad about this speaker, so we decided to mention these two small and not so important ‘’flaws’’. This speaker can’t be used for phone charging, and that’s probably because the drivers already need all the power they can get to keep working. The speakerphone is also not included because the manufacturer just wanted to keep it simple and avoid all the unnecessary features. There is no need to introduce you to Marshall, you probably know about it already since it is one of the most popular names in audio industry. Marshall was making amplifiers for many years, and only recently started making headphones and speakers. Kilburn is their first portable Bluetooth speaker, and it has all the recognizable Marshall’s aesthetic details, and even more important, it produces incredible sound that you expect from any Marshall audio device. Marshall put great effort into making everything about this speaker visually appealing. Even the box and user manual look incredibly stylish. Inside the box, you will find the speaker (which has classic Marshall design), coiled audio cable with gold-plated 3.5mm jacks on both ends (it reminds us of old-school guitar-amp cords), power cord (for charging), and user manual. The speaker looks like mini version of some old-school Marshall amplifier. The front panel is covered with woven aluminum grille with frame around it. The left and right sides, as well as the top side, are covered with vinyl, which gives it nice and stylish design. The speaker is not so small as some previous speakers we mentioned, but it is still very much portable. Its dimensions are 242mm (width), 140mm (depth), 140mm (height), and it weighs 6.6 pounds (more than 3kg). The speaker comes with removable carrying strap (which looks just like guitar strap, only smaller). All the controls are at the top, on the metal gold-plated panel. On the panel, you will find AUX-in port (if you want to use audio cable), three LED indicators (which show the chosen source and battery status), three old-school knobs for volume, bass, and treble, source button (for shifting between Bluetooth and AUX), pairing button, and retro ON/OFF switch. On the rear panel, you can see one bass-reflex port and charging port. At the bottom, there are 4 rubberized feet. Inside the speaker, there are two ¾ inches tweeters and one 4 inches woofer. Each driver has its own class-D amplifier – there are two amplifiers with rated power of 5W (for tweeters) and one 15W amplifier (for woofer). The combined power of the speaker is 25W, which is not amazing, but it is still much more than most of the small speakers we mentioned previously. If you want well-designed speaker, and if that’s one of your priorities, you can’t go wrong with Marshall Kilburn. 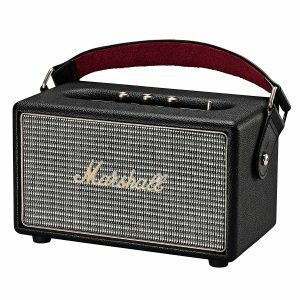 It is incredibly stylish, with bunch of retro details, and recognizable Marshall signature sign on the front panel. It is available in black and cream colors. From what we’ve experienced, Marshal has made very sturdy, durable speaker. Strong aluminum mesh protects the drivers, vinyl has aesthetic, but also protective function. It is safe to say that this is a durable speaker, capable of withstanding heavy use for long periods of time. 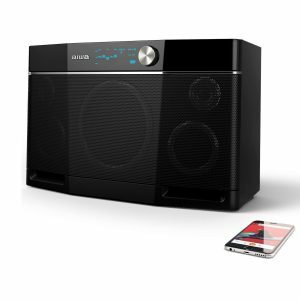 Kilburn speaker uses Bluetooth V4.0 which allows pairing with any Bluetooth-enabled device within 33ft range. Pairing is very simple – you just have to choose the source (by pressing source button), then press pair button and find the speaker in the list of available Bluetooth devices. The connection is stable inside 33ft range, although it is probably safer to stay inside 15-20ft range. There is no NFC function, which is small downside, at least for Android users. Kilburn has Li-Ion battery with rated capacity of 2,200mAh. The battery allows up to 20 hours of listening to music per one charge at moderate volume (some 50%). In reality, it’s slightly less than that (around 19h), and if you crank the volume up to the maximum, battery will last less than 10 hours. This is more than decent battery durability for a portable speaker. Marshall included bass and treble knobs, which are interesting additional features. Not many speakers have these functions, so we have to give some credit to Marshall and its speaker. Even when these knobs are at minimum, you will get pretty decent (probably more than decent) sound with strong bass, but if you are a bass head, or if you have the affinity towards high-pitched tones, you have the option to adjust the sound to your preferences. Kilburn offers very good sound quality, with strong punchy bass which gets just a little bit muddy at high volume, full and sweet mids, and clean highs. Don’t think you will be blown away – after all this is not some large speaker, but it is more than satisfying in many situations. A small amount of distortion is noticeable at high volume (above 90%). Although it is rugged and sturdy, this is not waterproof speaker, so be careful with it. It is probably not a good idea to take it to the pool, or to the beach with you. This is speaker for smaller backyard barbecue parties and similar events. Marshall decided to make a speaker and nothing else. You won’t find any additional features, Marshall makes music-oriented devices, and that’s what you get with this speaker. 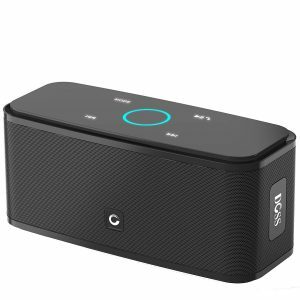 G-BOOM is one of highly praised Bluetooth portable speakers. The feature that was particularly praised by many people was bass and we decided to check and see if this is true. Keep reading if you want to find out all the good and bad things about this interesting speaker. The speaker is made by G-Project company, which is one of the younger players on the market. It was established in 2012 as part of the BOOMBANG which is a Think Tank company that usually cooperates with other audio-equipment companies like Harman Kardon or JBL (and this is not their only area of expertise). The speaker comes in a pretty large box with lots of advertisement on it. The size of box is kind of misleading, and might make you think that the speaker is larger than it actually is. Inside the box, you will find your G-BOOM speaker, power adapter (for charging), and user manual. Dimensions of the speaker are 10.2 inches (height), 11.8 inches (width), 4.9 inches (depth), and it weighs around 3 pounds. The speaker is oddly shaped, it looks like a lunchbox or like some prop made for Lego Movie. The front panel is completely covered with strong aluminum grille, and all the controls are on the top. You will find there 8 buttons – power button, Bluetooth (pairing) button, EQ button (for choosing EQ preset), rewind button, play/pause button, forward button, and Volume Up and Volume Down buttons. There is strong carrying handle at the top. Below the aluminum grille, on the front panel, there are three LED indicators (first LED indicates that it is turned on, the second indicates battery status, the third one is Bluetooth indicator). On the rear panel, there are two big bass-reflex ports and a small rubber flap. Under the flap, you will find AUX-in port, charging port, and USB port (for charging your phone). Inside the speaker, there are 4 drivers (2 woofers and 2 tweeters) with combined power of 18 watts. There are two bass-reflex ports at the back. 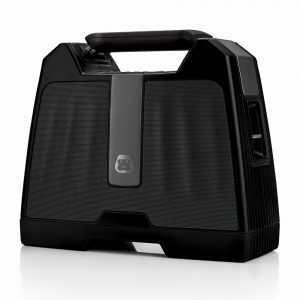 G-BOOM is well-built speaker, it feels and looks sturdy like it could take some beating. Durability is not an issue with this speaker, and there were no complaints regarding durability. G-Project doesn’t provide info on Bluetooth version, but from our experience, the Bluetooth range is some 30ft, and if you want to avoid cutting out then stay within 15ft range, Pairing is simple, it functions pretty much the same like with any other speaker. The connection is stable without interference. G-BOOM uses 1,500mAh Li-Polymer battery, which allows up to 6 hours of listening to music at moderate volume which is far from great, but it is not bad enough for considering it bad (although we had some doubts). This speaker offers decent sound quality and loudness. It’s far from what bunch of ‘’happy customers’’ claim, but it is not bad at all. Bass is strong and punchy but not enough to really feel it, and it gets pretty muddy at higher volume. Mids are articulate but not perfect, and highs are clean until you raise the volume up (above 80%). Distortion is pretty noticeable at high volumes. For a relatively small speaker, the sound is probably more than satisfying, but it’s far from being great. Depending on your preferences you can choose between 3 EQ presets – flat, rock, and pop. Rock offers the biggest amount of bass, while the pop preset offers slightly improved mid-range and treble. Flat preset is pretty much self-explanatory. This is always nice additional feature, and we like to see it on a portable speaker. The only problem is that the battery is not really large (compared to some other speakers on the list). We’ve already described this speaker, and we think it’s not for everybody. We don’t like it, but this is really a matter of taste, and you should not pay attention to what we think when design is concerned. The only important thing is that you like it. The speaker has no IPX rating, although it has bunch of rubber parts, which should provide some kind of protection. Still, don’t test it, and stay away from the water if you buy it. G-BOOM doesn’t have built-in mic, so you won’t be able to use it for hands-free calls. G-BOOM is advertised as the best speaker under $100, and we strongly disagree with this claim. This is decent speaker, it offers well-balanced sound and decent loudness, but there are some speakers in the same price range which could be considered better than G-BOOM (like JBL Flip 4 or VAVA Voom 21, for example). This is the second AOMAIS product on our list, and it’s here for a reason. It is incredible how this manufacturer managed to include so many functions without raising the price to the sky. We know what you are thinking right now – it’s probably poorly built or has some quality issues. Well, you are wrong. This is really more than a decent speaker and probably one of the best you can buy for around $50. The sound quality will not be perfect, but it is much better than you could possibly expect. Keep reading and find out more about this amazing, and relatively affordable speaker. The speaker comes in a simple box, and inside the box you will find audio cable with 3.5mm jacks, charging cable (USB to micro USB), AC adapter, carrying bag, user manual, and 1-year warranty. This is one of many boombox-like speakers on the market. It is not so small, but it is not too big – its dimensions are 13.5 inches (width), 7.5 inches (height), 3.8 inches (deep) and it weighs 4.2 pounds. The front and back panels are covered with protective black aluminum mesh. The whole speaker is covered with rubber, and it looks and feels very durable. At the top, there is thick reinforced rubberized handle, and at the bottom, there are rubberized feet which provide stability. All the controls are on the front panel, above the aluminum mesh. There are four buttons – power button, – button (press and release to lower the volume/press and hold to play the previous track), play/pause button (which is also used for answering/ending calls), and + button (press and release to crank the volume up/press and hold to skip the track). On the left side of the speaker there is a rubber flap and under the flap, you will find mic-in port and mic volume controls. On the right side of the speaker, there is another rubber flap under which you can find USB output port (for charging your phone), AUX-in port, and charging port. Inside the speaker, there are two 15W drivers and at the back, you will see two passive radiators. 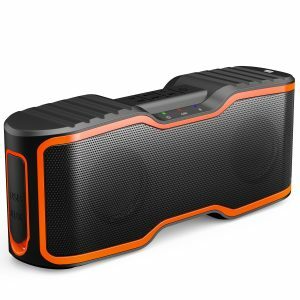 As we already mentioned this is one more boombox-like speaker with rubber finish. It looks nice and kind of sporty, which was probably the intention of the manufacturer. It is available in 3 colors – black, red, and blue (only the color of the rubber changes, all models have the same black aluminum mesh). The speaker is rugged and compact. It feels and looks very durable, and from what we have experienced, we are certain that this one can survive some heavy use, and could also take some beating. This is IPX7 rated speaker, which means it can be completely submerged into the water up to 1m deep for 30 minutes. We have tested it with some water (we didn’t submerge it, just spilled some water over it) and it works just fine. This is perfect speaker for pool and beach parties. AOMAIS GO uses Bluetooth V4.2 and allows pairing with any Bluetooth device within 33ft range. We didn’t experience any problems regarding compatibility or connectivity. Pairing is simple and it starts the moment you turn on the speaker. The connection is stable and without cutting out as long as you are within the Bluetooth range. Although it is pretty loud, you can get even louder sound by pairing two speakers into a system. The pairing is possible only through the Bluetooth connection (TWS pairing). According to what AOMAIS claims, speaker’s battery can last for up to 30 hours at moderate volume (50%), while in practice it is much less than that (some 8 hours at 70% volume), but is still decent. The Li-Ion battery is pretty large and it has capacity of 7200mAh. This is nice additional feature which is not so common, and because of that, deserves to be mentioned. You don’t have to use it, but it is really nice thing to have, just in case you decide to throw an ad hoc karaoke party. Thanks to pretty large battery that we’ve already mentioned (7,200mAh), it is possible to charge your phone twice or three times, so this feature has to be mentioned. Two drivers and two passive radiators with 30W of power offer pretty loud sound. It is not amazing, it will not blow you away, but it could be enough for smaller parties (up to 20 people), especially if you pair two AOMAIS speakers. AOMAIS GO speaker produces bass-heavy sound, with pretty clean mids and highs. This is definitely bass-oriented speaker, mids and highs might lack some details, but for the amount of money you pay, you can’t expect more than this. You will notice really small amount of distortion at max volume. To conclude, this speaker offers great sound for the price, and you won’t regret if you decide to buy it. This is not common issue, but some customers complained about the buttons. They don’t break, but they can become unresponsive. Some 5% of users experienced this problem. The story behind the name Aiwa is long and interesting. It started in 1951. Originally, this was Japanese company, and at the beginning of the 2000s it was bought by Sony, but this was bad business decision, and Sony quickly discontinued the production of all the AIWA products. In 2014, AIWA was born again – Joe Born bought the rights to use AIWA brand and started new audio equipment company. One of the best and most famous products of this new company is Exos-9 Bluetooth speaker. This is one of the best portable Bluetooth speakers on the market in terms of sound quality and loudness, and it is probably one of our favorites. It’s not so cheap, and you will have to spend significant amount of money on it, but it is definitely worth it. Exos-9 comes in a big stylish box (you can immediately see that this new Aiwa pays attention to the presentation), and inside the box, you will find the speaker, battery, charging cable with AC adapter, AUX audio cable with 3.5mm jacks, user guide, and 1-year warranty. The front panel is covered with black aluminum grille, while the sides, the top, and the rear panel are made of plastic. The plastic on the side and at the top, just like the small piece of plastic with EQ screen and volume knob above the aluminum grille, have glossy finish which is kind of a fingertips magnet. The speaker has touch-sensitive controls on the top – you will see nice-looking touchscreen, which you can use to play/pause songs, adjust the EQ, and link two speakers. Next to the touchscreen, there is NFC tag for easy pairing. On the rear panel, you can see concealed reinforced handle, bass reflex port (in the middle), and at the bottom you can see removable battery, power switch, AUX-in port (if you want to connect your non-Bluetooth device with the speaker), USB output port (for charging your phone), and micro USB input for firmware updates. The speaker is portable (battery powered) but it is not small at all – it weighs almost 13 pounds, and its dimensions are 19.4 inches (width) x 11.7 inches (height), and 7.5 inches (depth). Inside the speaker are 5 powerful drivers – two midrange drivers (3 inches in diameter each), two tweeters (1 inch in diameter), and one subwoofer (6.5 inches in diameter), with dedicated class-D amplifiers, and combined power of 200 watts. Aiwa made a nice-looking, visually appealing speaker. It looks so attractive, maybe even too attractive for an outdoor speaker. This speaker looks like it was designed for indoor use, but all the other characteristics imply that it can be used outside. The speaker is compact and looks expensive (probably because it is expensive), although it is not rugged, and it was not made for all weather conditions. It looks like it could survive some heavy use. Exos-9 uses Bluetooth V4.2 which allows pairing with any Bluetooth-enabled device within 50ft range. In reality that’s only possible if there are absolutely no obstacles between the speaker and your phone, and it is probably best to stay within 20-30ft range. Pairing is very simple, it’s almost automatic. There were no connectivity or compatibility problems. If you have Android phone you can turn on NFC function and just tap the NFC circle on the top panel, and pairing is done in just a second. If you have two Exos-9 speakers you can link them by pressing link button on one and then on the other speaker. Once they are linked, you can press link button to shift between stereo separated mode (one speaker acts as the left and the other as the right speaker) and dual stereo mode (both speakers stream the same source). Exos-9 has large 2,600mAh Li-Ion battery which can last for up to 9 hours at moderate volume (some 60%), and up to 4 hours at max volume. You can buy extended battery separately which is twice as large and offers up to 18 hours of playtime at moderate volume. This is one of the features that makes Exos-9 speaker so special. EQ controls are on the top, and EQ screen is on the front panel above the aluminum grille (which is not the best arrangement). You can choose between 4 different EQ presets, or you can control 5 different frequency bands separately if you don’t like the presets. Thanks to its powerful drivers, this is one of the loudest portable Bluetooth speakers on the market – it can produce the sound louder than 100dB. Exos-9 is definitely louder than any speaker we’ve already mentioned, and it is perfect choice for parties (up to 50 people). If you need even more loudness, you can always buy 2 and link them. This is one of the best features of the Exos-9. The sound is perfect – strong and punchy bass, full and detailed mids, and super-clean highs. That’s what you can expect from this speaker. Listening to music is such a great experience with Exos-9. This is the feature that always comes in handy, especially if you are outdoors. Exos-9 has pretty large battery, so you will be able to fully charge your phone while listening to music. AIWA allows to its customers to install firmware updates on their own. You can connect your PC and your speaker via USB to micro USB cable, download updates from AIWA website, and install it. This was very useful feature when the first version of Exos-9 speaker entered the market because there were some firmware bugs, and these small updates solved all the problems. Today’s version is almost bug-free, so you won’t have to use this feature (at least not so often). AIWA Exos-9 doesn’t have any IPX rating and it is absolutely not waterproof. It looks really sensitive (especially touchscreen), so we advise you to keep it away from the water. Touchscreen is supposed to be sensitive, and this one is not sensitive enough. Sometimes you have to press the touchscreen a little bit harder in order to get some response. You have the option to buy remote control separately, but considering the price, it would be nice to get the remote along with the speaker. ION is an American audio equipment company. They don’t really make state-of-the-art equipment, but rather cheap and decent products for everyday use and DJ beginners (since they make turntables, and other DJ equipment). We decided to present to you one of the most popular speakers made by ION – Audio Tailgater IPA77. This speaker is something between medium-sized speakers and big party speakers. It is the largest speaker on this list, but if you think you need something even larger and louder, you can take a look at our previous article on top 10 loudest Bluetooth speakers. Our opinion is that this speaker is one of the greatest party speakers, especially when you consider price-quality ratio. ION Audio Tailgater IPA77 comes in a large box along with charging adapter, AUX audio cable with 3.5mm jacks on both sides, and user manual. IPA77 is kind of medium-sized speaker. There are some much bigger speakers on the market, but it is definitely not as small as some of the speakers from the beginning of our list. It is 9.4 inches wide, 12.8 inches high, 12.5 inches deep, and it weighs 16.5 pounds, so it is kind of hefty. The front side is covered with black sturdy aluminum grid, and the rest of the speaker is made of sturdy industrial plastic combined with wood. At the top there is nice-looking control panel with bunch of controls and inputs – there are AUX-in port, mic-in port with mic volume knob, Bluetooth button, radio button (for choosing radio mode and shifting between AM and FM), 2 track management buttons (which are also used for stations searching), play/pause button, master volume knob, and USB output port (for charging your phone). Above the buttons, you will see small screen which shows battery status, Bluetooth status, and radio frequency. On the top of the speaker, you can find NFC tag for easy pairing (in case you have Android phone) and radio antenna. On the rear panel, you will find only charging port and ON/OFF switch. On the left and on the right side of the speaker you can find two reinforced carrying handles. Inside the speaker there are 6.5inch woofer (50W output power) and passive radiator. This is another boxy speaker with nice rounded edges. It isn’t flashy or tacky, but it is simple and elegant, and if you are searching for something like that, this is the right choice. The speaker wasn’t made from some premium materials, but it looks pretty durable, and it could probably take some beating without problems. There were no complaints regarding durability in the past. This is one of strong sides of this speaker. It uses Bluetooth V4.2 technology which allows pairing with any device within 100ft, and in reality, anything farther than 65ft could be problematic. Still, the Bluetooth range on this thing is pretty amazing when you compare it to some other speakers on the list. Pairing starts automatically when you turn on the speaker, and pairing process is so simple. The connection is stable, without interference or cutting out. If you have Android phone, you can turn on this function, tap the speaker with your phone and you are ready to go. The battery is another great feature of this speaker. The manufacturer claims that it can last for up to 50 hours at moderate volume (at 50%), and in reality, it’s more like 45 hours. When you raise the volume up to some 70%, the battery will last around 20 hours. 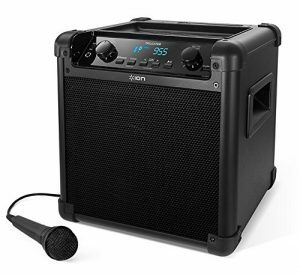 This is great additional feature if you like karaoke parties, or if you want to use it as a PA system, then this is the right speaker for you. You will also get a microphone along with the speaker – the mic is not great (you can’t really expect that for such a small amount of money), but it’s but it is more than enough for nice karaoke party. If your phone dies, you will find this feature extremely useful. Thanks to incredibly large battery, you will be able to charge your phone and listen to the music at the same time for hours. This is nice additional feature, whether you like to listen to radio or not. You never know when you are going to need it. Thanks to its strong woofer and passive radiator, this speaker can get pretty loud, even at 70-75%. We advise you not to go above 75% because of the distortion which becomes more and more noticeable as the volume goes up. Speaker offers pretty good sound quality, you will get punchy bass, articulate mids, and clean highs. Mids and highs are maybe not rich enough and maybe lack some details, but the sound is still more than decent and well-balanced. Bass and treble get kind of muffled at higher volume. We couldn’t really find some bigger flaws, but that doesn’t mean that there is no room for improvement, but for this price, it would be rude to criticize it that much. We’ve decided to mention only antenna which is, in our opinion, pretty fragile and it looks like it could be broken easily, so be careful with it. It would be better if the antenna was rubberized. Battery capacity (often called battery size) in mAh or Ah is an important thing you should pay attention to when buying Bluetooth speakers, but the capacity itself won’t tell you the independent playing time of a battery-powered speaker. In order to understand how long will you be able to listen to music per one charge, you need to know the power consumption of the specific speaker. Depending on these two characteristics, independent playing time will change, so it is possible that some smaller speaker with 1,000mAh battery has longer playtime (e.g. 12 hours) than some larger speaker with 5,000mAh battery (e.g. 8 hours), only because of the huge power consumption of the larger speaker. Independent playing time of the speaker depends on the version of Bluetooth that was used, but we will discuss that issue in the next section. Some battery-powered outdoor Bluetooth speakers have shared battery (many high-end speakers), which could be really useful if your phone battery dies. Shared battery means that these speakers have additional USB port, and you can use it to charge your phone, so we advise you to look for outdoor Bluetooth speakers with this function. The capacity of the speaker’s battery is important for the shared battery function, and if your phone has ‘’smaller” battery than the speaker, then your speaker can be used for charging your phone (some speakers have so large battery that you can charge your phone more than once). Bluetooth version that was used in a certain speaker is important not only for connection quality (which is probably the first thing you would think of) but also for battery life and connection range. For all of these features, there is one simple rule – newer is better. 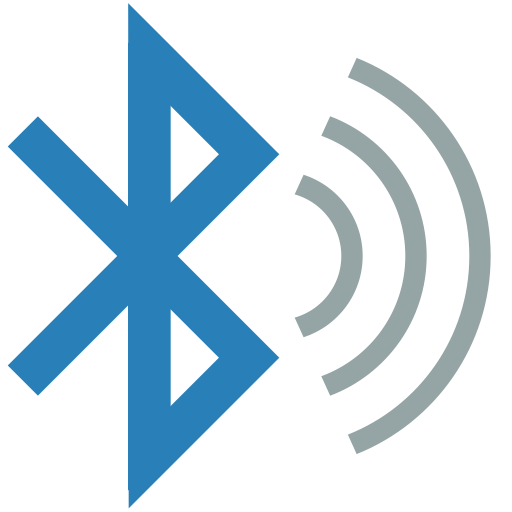 The oldest Bluetooth version that can still be found in some devices (some speakers also) is V2.1, which is the version that introduced two interesting features – EDR and SSP. 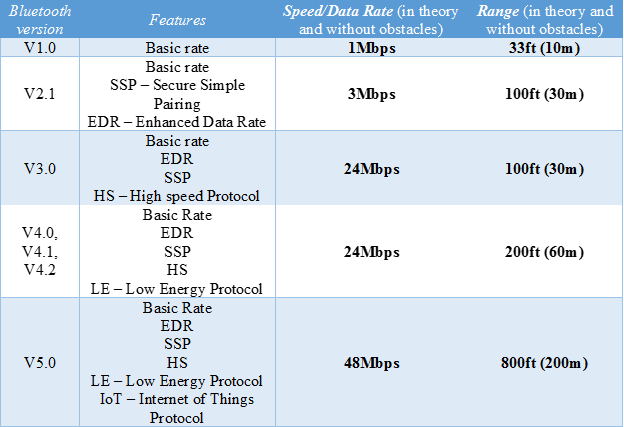 EDR (Enhanced Data Rate) is the technology that improves data rate from 1Mbps (which is theoretical data rate of the first Bluetooth version) to 3Mbps (in theory, of course), and SSP (Secure Simple Pairing) makes the process of pairing two Bluetooth enabled devices easier and more secure. The version 3.0 introduced new HS (High Speed) technology, which enables data transfer at much higher rates (up to 24Mbps) by using Wi-Fi network. Version 3.0 is not so widely used, probably because it was quickly replaced with version 4.0 (and its successors 4.1 and 4.2). These 4.x versions brought us longer range and lower power consumption (thanks to Low Energy Protocol). Version 5.0 brings speed, range, and power consumption improvements, which are greater than ever before, but we will have to wait a little bit before V5.0 becomes the standard. For now, only a few phones have Bluetooth V5.0 (Samsung Galaxy S8 and S8+, OnePlus 5, LG V30, Xiaomi MI6, iPhone 8, iPhone X), but there are still no speakers (or headphones) with Bluetooth V5.0, so you will have to be patient. One more thing we should emphasize once more is the power consumption – all the newer models, especially V4.0, V4.1, V4.2, and V5.0 (thanks to Low Energy capability) have much lower power consumption than some older versions. These are all the reasons why you should pay attention to Bluetooth version when buying your new outdoor Bluetooth speaker. Since you want to use your Bluetooth speaker outdoors, they need to be rugged, compact, and durable. Lots of metal parts, rubberized covering, and sturdy industrial plastic are the materials you should be looking for. Some IPX rating should also be considered an advantage, since you need your speaker to survive a couple drops of light rain, at least. You don’t want something too sensitive for outdoor use. If you’ve been wondering what all those IPX ratings mean, you can see all the explanations below. IPX1 – it means that your speaker can survive a couple of drops (you should understand ‘’A COUPLE’’ quite literally), but only if they fall vertically. So, to conclude IPX1 is not something you should consider as some great advantage – it’s just slightly better than IPX0 (not waterproof). IPX2 – this is slightly improved version of IPX1, and it means that drops (the same amount) can fall on your speaker at 15 degrees angle (not only vertically), and this is still not the good kind of protection for your new outdoor speaker, and you should be searching for something better. IPX3 – this is the first rating that could be considered satisfying (although, you should be looking for something even higher). IPX3 rating means that your speaker will survive sprays of water at any angle up to 60 degrees (from the vertical) for 5 minutes. IPX4 – if you don’t want to be bothered with angles, and some idealistic conditions under which your speaker might or might not survive, then IPX4 or anything above that is what you need. Your speaker will be able to survive splashes of water from any direction if it has IPX4 rating. Devices with IPX4 rating can be considered splash-proof. IPX5 – it means that your speaker can survive smaller water jets (some 13l per min is the maximum volume). Devices with IPX5 and IPX6 ratings can be considered water resistant. IPX7 – it means that your speaker can survive full immersion into the water (up to 1m depth) for 30 minutes. Speakers with IPX7 and IPX8 ratings can be considered completely waterproof. There are also some speakers with IP rating with two numbers, and if this is the case, you should know that the second number describes water ingress protection, and the first number describes the solid particles ingress protection (such as dust, or ants). If you are looking at a speaker with IP rating, the first number should be 5 or 6. 5 means that your speaker is dust protected, which implies that there is still possibility for some dust to enter your speaker but not enough to damage the speaker or to interfere with the normal operation of a speaker. If the first number in IP rating is 6, then your speaker is completely dustproof and there is no chance for dust to enter the speaker. Ideally, you should be looking for a speaker with IPX7 or IPX8 ratings, or with IP67 or IP68 ratings. If you decide to buy a speaker with lower IPX or IP rating, you should be aware of the things your speaker can and can’t survive. Loudness is often considered important feature of any speaker, but it is often confused with power rating. Higher power does mean that some speaker can get loud, but it isn’t the only criterion that determines the maximum loudness. For the maximum loudness, you have to consider speaker’s sensitivity (nominal loudness in dB or dB/W) and speaker’s power rating (expressed in Watts). Most of the manufacturers won’t give you the maximum loudness in their specifications lists, so you will have to dig harder to find this additional data. In short, if you want your speaker to be loud (if you want to use it as a party speaker, for example) you should be searching for really sensitive (90 or even 95dB) and really strong speaker (couple hundreds of Watts). If you want to find out more about loudness and influence of speaker’s sensitivity and power on maximum loudness, we recommend reading one of our previous articles on top 10 loudest Bluetooth speakers. Additional features are always a plus, and there are some features that could really come in handy in some situations. Some of these features are AUX input, speakerphone, USB battery charger, or outputs for connecting multiple Bluetooth speakers into a system. AUX input might seem redundant on a Bluetooth speaker, but in fact, it can be incredibly useful if you have problems connecting your phone (or any other Bluetooth device) with your speaker. Also, AUX input extends the lifespan of your speaker in case your Bluetooth adapter dies. As you can see, AUX input is incredibly useful thing, and you should definitely search for a Bluetooth speaker with this additional option. Some people like having the option of answering and making calls by using their speakers. We are not crazy about this function, but if you like these things, there is bunch of Bluetooth speakers on the market (and on our list) with this feature, especially the smaller speakers. We already mentioned shared battery function, and we won’t repeat all the things we’ve already said. In short, having additional USB port for battery charging is really useful thing, especially if your speaker has some large battery (4000mAh or 5000mAh) – if your phone dies, you will always have the option to charge your phone and listen to the music at the same time. 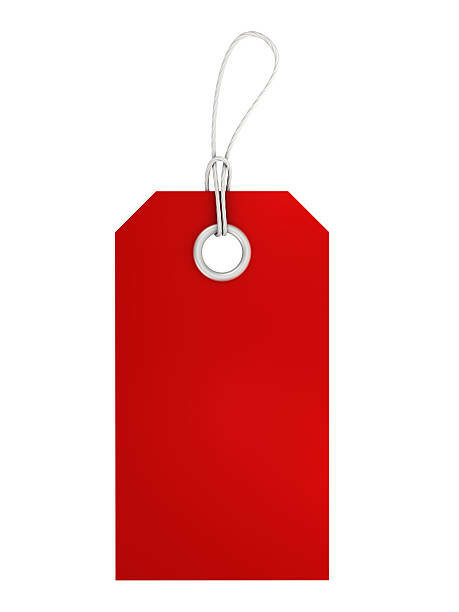 The price is always important no matter what you are buying. Depending on the type of speaker you want to buy (small, larger boombox-like speakers, or party speakers) the price will vary. The price also depends on the manufacturer, so if you want some famous brand (like Bose, Harman Kardon, or Marshal) or if you want a handmade speaker you will have to pay more. There is always the possibility to pay less and still get very good quality (sound quality, construction quality) with some not so famous brands. The price of a small speaker can go up to $150 (Bose Soundlink, UE BOOM speakers), but you can find very good speaker for under $100 (JBL Flip 4, VAVA Voom 21), and there are some good and very much affordable Bluetooth speakers for under $50 (AOMAIS Sport II, DOSS Touch, Anker SoundCore). If you want something louder, and you are prepared to pay more, you can find great outdoor Bluetooth speakers for some $300 to $400 (BRAVEN BRV-XXL, Marshall Kilburn, JBL Boombox, Aiwa Exos-9), but there are also some more expensive handmade Bluetooth speakers (like DiamondBoxx Model L). If you need a party speaker, you can find some for under $200 or even under $100 (like ION Audio Tailgater or Pyle PA Speaker System), but if you want really high-quality speaker then you should be prepared to pay up to $1000 (Soundboks 1) or even up to $2000 (DiamondBoxx XL). Hi everyone, it says that the JBL connect+ will let you link more than 100 JBL connect+ enabled speakers together. Has anyone tried linking more than two JBL speakers? What’s your experience on this? That’s a funny question. The answer is no. We have never had a chance to link more than 3 speakers (of any kind). The only place where you can see multiple JBL speakers paired together is some larger audio store or some JBL’s showroom. First of all, thanks for the awesome article. It really helped me a lot. 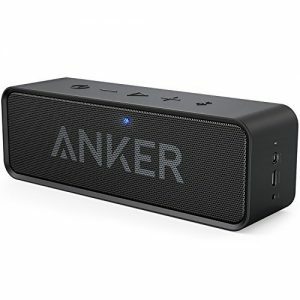 So, I have decided to buy the Anker Soundcore speaker. It’s fantastic and has an awesome battery life. 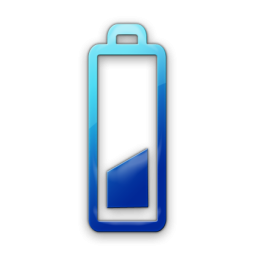 The only thing about the battery i would like to see in the newer model would be a battery indicator. I just feel better knowing when it will go out. Honestly, I didn’t expect a great sound quality because of its size but I have to say I was pleasantly surprised. Everything else is just as expected. I would definitely buy it again! The JBL Flip 4 is absolutely amazing. I love the build quality and its bass. The wrist wrap is quite handy, and the fact that it’s waterproof is a great feature for me. The battery life is fantastic. I really don’t have any worries whether it will last enough or not. It pairs up easily with mu smartphone. We are glad you’re happy with the purchase, especially if our our review helped you make a decision. Goodness, this article really is one of the best and most comprehensive I’ve seen in a very, very long time! You’re list of outdoors speakers are really great, I would just like to know why the Polk Audio Atrium Series aren’t featured? I really think they are great and durable speakers, all with very clear sound. Especially the Atrium 6, having a more defined bass. The Atrium series are definitely my go-to’s! Thank you for your comment. The thing is – all the speakers on our list are Bluetooth-enabled. The title says 15 Best Outdoor BLUETOOTH Speakers. Polk Atrium 6 does sound great and it is an outdoor speaker, but it’s not Bluetooth-enabled. That’s why it’s not on the list. Thank you for your comment. You are absolutely right about Marshall Kilburn. It does look way too delicate and too sophisticated for outdoor use. Also, it’s not really rugged. Still, it is technically portable (it has a built-in battery) and it can be used outdoors and on the go. You just have to be really careful.